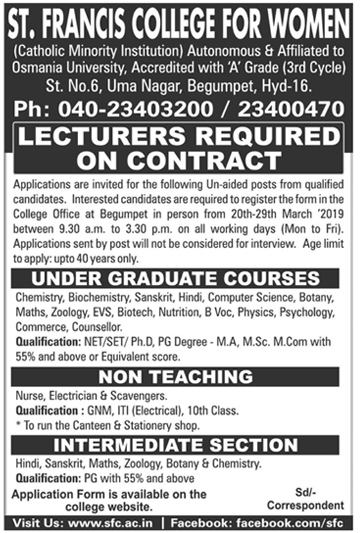 and Interested applicants can apply from 20-03-2019 to 29-03-2019 for Non-Teaching/Lecturer Posts. Eligible candidates are required to register the form in the college office at Begumpet in person. Timings between 9:30 to 3:30 pm on all working days (Mon to fri). Applications sent by the post will not be considered for interview. Further details refer the official website for http://www.sfc.ac.in/ of St. Francis College for Women Recruitment 2019. Salary, Application Procedure, Qualification, Email-id, Postal address details are given below. Starting date to apply for Non-Teaching/Lecturer Jobs: 20-03-2019. 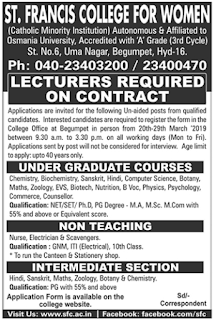 Ending date to apply for Non-Teaching/Lecturer Jobs:29-03-2019. Interested and eligible candidates are requested to register the form in the college office at Begumpet in person. Timings between 9:30 to 3:30 pm on all working days (Mon to fri). Applications sent by the post will not be considered for interview.